The suggested temperature range for the roast beef was from 60 °C for a pink interior to 68 °C for grey meat. I settled on 63 °C. I was a little optimistic regarding the timing, so when our guests had arrived and I checked the meat (after 1h 30m) the core had only reached 53 °C. First lesson learnt: meat is a poor heat conductor. I quickly figured that my guests would become very hungry if I were to wait for the core temperature to reach that of the water bath. I therefore turned the water bath up to 68 °C, and put the meat back into the water bath – this time in a normal plastic bag and with a temperature probe at the core. This worked surprisingly well, the pressure of the water pushing out all the air. After another 45 min it had reached 62 °C and I removed the meat from the water bath, saved the juices for the gravy, rubbed the meat with salt and pepper and gave it a quick pan sear with plenty of butter. Despite my bad timing the beef came out extremely moist and tender – I dare say that I have never before achieved such a result with a roast beef in my kitchen! And being my first attempemt at sous-vide with my immersion circulator it was extremely satisfying. Today I prepared the chicken breast, and I figured that 1h 30m should be sufficient for 700 g of meat. The chicken came out very nice as I served it with fresh pasta, a curry sauce and some salad. Again the meat was moist and tender – and so different from most of the chicken I’ve prepared both at home and been served at restaurants. I should also mention that I made 68 °C eggs this morning. I left them in the water for 1h. The egg white was very soft – almost runny – whereas the yolk had set but was still very pliable. Comparing this with the eggs over at Fooducation it’s clear that even with constant temperature time does play a role. My 1h @ 68 °C eggs had a white that looked more or less like the white of Erik Fooladi’s 6h @ 65 °C eggs. The are probably several reasons for this, but I guess that the kinetics of protein coagulation are mcuh more complex that one might expect at first. But that’s a different story. Several comments to my last post asked about pricing and where to buy immersion circulators. Basicallyl any laboratory supplier sells these. And even the simplest models have temperature stability of +/- 0.1 °C or less. Amazon also has a couple of models available from Fischer/Thermo Scientific ranging from around $900-2000. « Previous: Santa came early this year! Did you use something like this to prevent leaking? No – the bag was still open, but the weight of the meat made it sink in the water, and the water pressure also help push out the air. I secured the top of the bag to the handle of the pot I used for the water bath. Of course since it was still open I could easily insert the thermometer. All in all very low-tech – nothing near the puncture pads you refer to. I echo your comments about the ease of sous-vide. Since I got a temperature-stable water bath (albeit mine’s a bit more improvised) I’ve used it practically every week. It’s a stunning way to cook just about anything, and basically impossible to get wrong. I really do think it’s going to go mainstream within 10 years. Martin: eggs are indeed fascinating, and kinetics must play a role. Note the pictures after 6 and 26 hrs. The eggs MUST be warm throughout after 6 hours, but there is still development after this. Also, the age of the eggs is probably of importance as proteins are broken down during storage and pH increases. This would most certainly have an impact on denaturation/coagulation. Erik, I think Thomas Keller will be the one credited. He was touting the current sous vide revolution as early as anyone else as visible. And now with Under Pressure, I think hindisght will (somewhat justly) make him look like the pioneer. I just cooked some lamb shanks sous vide at 82 c for 2.5 hours. This turned out to be not long enough for perfect tenderness — yet the amount of moisture released into the bag was astonishing. The meat was not terrible, but it was also not as moist as some lamb shanks I have braised in an oven. This got me to thinking about a disastrously dry beef stew I did last New Years Eve, and my speculation then that there’s some factor that tends to makes meat dryer during the winter. I googled, but couldn’t find any information about this — is it just my imagination? I figure that if anyone would have information on this, you might. Isn’t 82 °C way to high for sous-vide? I’m not surprised that you release a whole lot of liquid at that temperature. I would stick with temperatures in the 60’s. I should also mention that this brings up one of the most important topics related to sous-vide: what temperature to cook at. I still haven’t found a definitive source here, but the Kamikaze blog has a nice listing of suggested temperatures. It works quite well, but not perfectly. Some of Thomas Keller and Grant Achatz’s recipes call for temperature controls by 1 degree changes. The Auber unit is digital, but the rice cooker won’t let you do it that fine. But for things like steak, it’s quite fine. I do have a Food Saver, but half the time, it doesn’t work. So I wind up using a Zip-Lock bag, folding it over a lot to get the air out, and frankly, that works fine–and it’s a lot cheaper than an electronic gadget that doesn’t always work. Since everyone in my family likes steak cooked barely black and blue, setting the temperature to 51 degrees produces excellent results. And my kids love using a creme brulee torch to brown the meat. Rare, browned steak with no pan to clean is great. I intend to try Keller’s vegetable ideas, but will pass on the short ribs that everyone else seems to like (well, I’ll try it once). However, I once grilled short ribs, and didn’t like the taste, so I think what I like is not only the gelatinous quality, but the sauce; and the sauce comes from the braising process. Plus braising food is fun. Simple, transformative, psycho-therapeuric, and nothing except for fresh baked bread can fill a house with so many wonderful aromas. Daryl: Yes – I’m aware of the PIDs from Auberins. I did consider them, but as you point out – I was a bit concerned about temperature stability/uniformity as there is no circulatioin of the water. That’s also why I didn’t opt for a water bath but rather a circulator bath. What you write about the food saver is interesting – could you explain in more detail what happens when it doesn’t work? I have considered trying to find a food saver, but then I’d of course like to know that it works as expected. More and more food is also sold as sous-vide cooked. 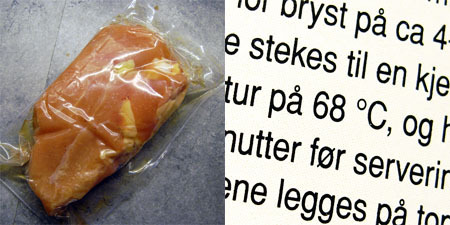 In Sweden is now most of the Christmas ham sold as sous-vide ready cooked, wrapped in the plastic bags it was cooked in. Martin, have you read the EXTREMLY long thread on sous vide on eGullet forums? Timing in cunking sous-vide is related to the volume, and is an exponential function, wich mades dificult to estimate the time for home cooks like us. Yes – I know it very well – and now that I’ve got an immersion circulator I expect to learn a lot from the thread. But it’s always difficult to know where to start when reading, especially as the forum navigation is not made for such long threads. Martin, I got a vertical model, which has a self feeding mechanism, which is totally unreliable. So I have resorted to flipping it open, placing the bag where I “think” it should be, then turning it on. It doesn’t always work. However, the zip top plastic bag always works. And when you carefully fold the bag, forcing the air out, it seems to be as good as the Food Saver, which is, after all, a fairly cheap non-commercial piece of equipment. I think you can get away without the circulating pump when you are using a large rice cooker, since the pot is so much larger than the immersion circulators. However, you’ve gotten me thinking. Perhaps the answer is some kind of small immersion fan or pump. I’ll check them out in pet stores (for small fish aquariums, they make lots of them). Considering the overall cost is about 20% of the Poly Science model, it’s worth it (not including the vacuum sealer). Do you think you could do Wagyu Beef with this? I wonder how the “non-rendering” of the fat would work, and it’s too expensive to experiment with. Darryl, of course you could do Wagyu beef. Fat renders because of (primarily) temperature. You just need to figure out how soft you want the fat, and what temperature is required to achieve that texture. I assume Wagyu fat will behave the same as non-Wagyu beef fat. Martin, I got an immersion circulator as well. http://www.eatfoo.com/archives/2009/01/immersion_circulator_1.php. I use a FoodSaver, but instead of getting one of their lower end consumer models, I went with their GameSaver line. The GameSavers are more powerful and made for more reliable repeated use. Specifically, I got the Gamesaver Turbo Plus, which not only has the more powerful GameSaver motor, but actually has TWO of those motors. It still can’t compress anything to nearly the degree that a basic chamber vacuum sealer can do, but it works quite well vacuuming for sous vide cooking. I very quickly got the hang of vacuuming things with liquid as well. So I recommend the GameSaver Turbo Plus. 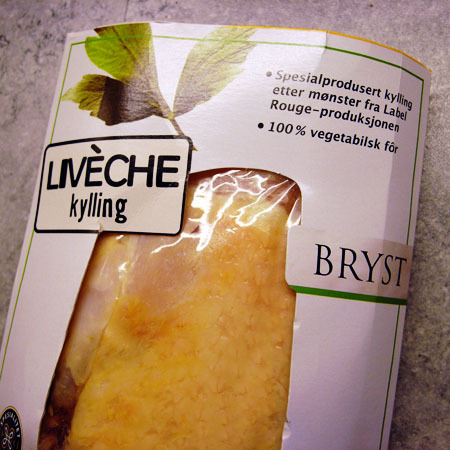 http://www.foodsaver.com/Product.aspx?id=c&cid=90&pid=251. Also, for the sorts of tough meats that would normally be braised, Thomas Keller generally recommends 82C for long periods of time. 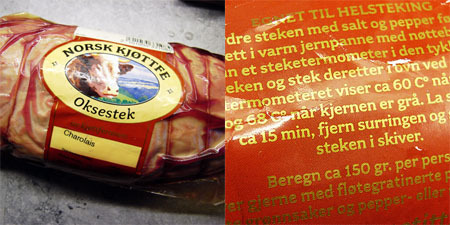 For instance, pork belly is 82C for 12 hours. Duck confit is 82C for 8 to 10. I also tried Heston Blumenthal’s pork belly, 60C for 36 hours, and it came out very well, though I think it would have been more tender at a slightly higher temperature. Barzelay: Congratulations! As I already commented too your blog post I’m really looking forward to see what home cooks can get out of sous vide. maybe this post is better here rather than in the previous thread! …I have just recently had Chief Scientist Bruno Goussalt over in Dubai to conduct a sous vide seminar to the regions chefs using, of course, our Vacuum Chamber machines but also a range of water baths from Clifton Food Range, UK – http://www.cliftonfoodrange.co.uk – very nice kit indeed. Using the cheapest store bought ingredients we could find, the most amazing results were achievable.